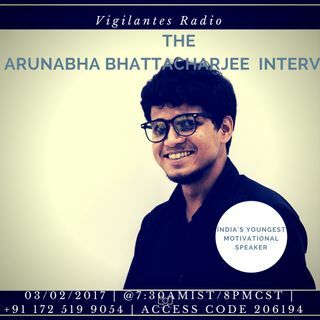 Interview with India's Youngest Motivational Speaker : Arunabha Bhattacharjee. Arunabha stops by to chat with Dini about being a motivational author and a life coach. Set your reminders, it's happening! 03/02/2017 | @8PM Central Standard Time/7:30AM India Standard Time | Skype in at whodini.blak | Please follow our show at www.spreaker.com/onlyonemediagroup & remember sharing is caring! Thanks for your continuous support!